So far, Archbishop Wilton Gregory, seen here on Good Friday at the Shrine of the Immaculate Conception Catholic Church, hasn’t budged on demands that he post the names of accused child molesters on the archdiocese website. Gigi Wieringa, who lives in Charlotte, holds a sign during a demonstration outside the Cathedral of Christ the King in Buckhead on Monday. 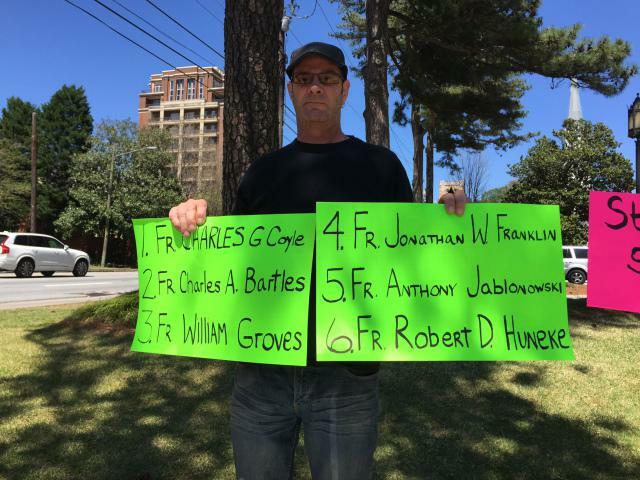 During Monday’s protest, Martin Prendergast, who lives in Memphis, holds signs showing the names of six priests who were publicly accused of abusing children, and who SNAP says spent time in Georgia. 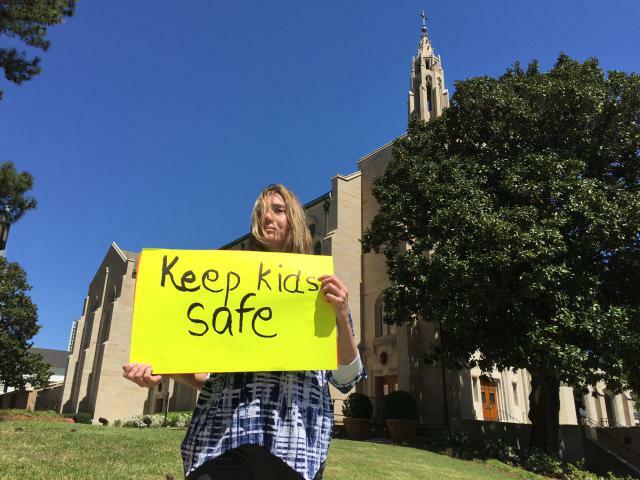 A victims’ support group says Atlanta’s top Catholic cleric isn’t being transparent about child sexual abuse by priests, instead withholding records that could protect children and help survivors. 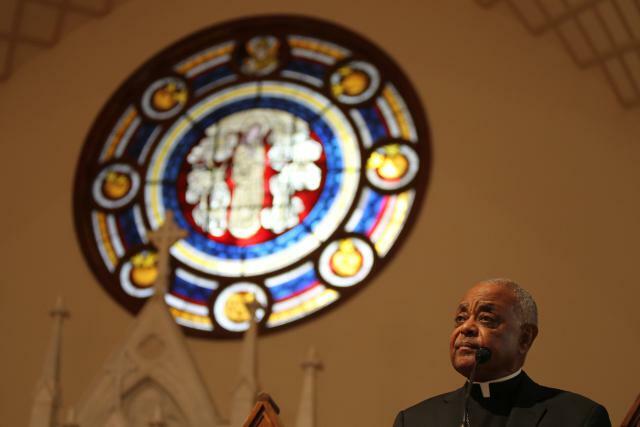 For more than a year, the group has been pressing Archbishop Wilton Gregory to reveal the identities of any priests, deacons, brothers or nuns accused of molesting children who spent time working in the Atlanta area. The nationwide Survivors Network of those Abused by Priests, or SNAP, wants a list of names posted on the archdiocese website, something more than 30 Roman Catholic bishops across the country have already done. Such a list would likely include names that have never been publicized, where accusations were handled internally then locked away in church archives. Blaine said the public has a right to know if any priests who faced serious accusations in other parts of the country spent any part of their careers in Georgia. Police and prosecutors also deserve a heads up, she said, and victims deserve acknowledgement. SNAP has even offered Gregory a head start, naming six priests who the group says should be on the list. They turned up in cursory internet checks, Blaine said. Two of them formerly worked at Marist School in Brookhaven and one spent time at the Ignatius House Jesuit Retreat Center in Sandy Springs, according to SNAP’s research of media accounts, the Official Catholic Directory and the abuse-documenting website Bishop-Accountability.org. The press release from the archdiocese was vague on the subject, not making clear what the priests did while in the Atlanta area. The statement also offered the phone number of an abuse hotline and the web address of its Child and Youth Protection Office. “We report all allegations to civil authorities and offer a number or resources on our website,” the press release said. Charles Coyle – A Jesuit priest who is now deceased. One of his alleged victims committed suicide. Spent time at the Ignatius House in the early 1990s. Charles Bartles – Another Jesuit priest, also deceased. Worked at Marist in the early- to mid-1970s. William Groves – A former priest who once pleaded guilty to sexual assault on a child. Received counseling in Atlanta in the 1990s. Jonathan Franklin – A priest who committed suicide after being accused of assaulting an altar boy. Worked in Atlanta and Savannah. Anthony Jablonowski – Former priest who pleaded no contest to a charge of molesting a 17-year-old boy. He was also accused of conducting rituals of penance that involved hanging young men upside down – bound, gagged and blindfolded – and flogging them. Once worked at St. Mark Catholic Church in Clarksville. Robert Huneke – Now deceased, he was implicated in a Suffolk County, N.Y., grand jury report. Worked as a guidance counselor at Marist in the early 2000s.